Height Range 18 to 63"
The E-Image GC102 Carbon Fiber Tripod supports up to 133 pounds of fluid head, camera, and accessories. The legs feature a 100mm bowl, which provides a wide support platform. The legs are made from carbon fiber so they are lightweight and corrosion resistant, and they feature three leg sections with mono-lock leg locks. The mono-lock design allows you to lock and unlock all the sections of each leg using only one rotating locking lever. The tripod extends to a height of 63" and collapses down as low as 18" with the ground level spreader extended fully. The legs feature spiked feet and come with a ground level spreader. The legs accommodate available mid-level spreader and available rubber feet that attach to the spiked feet. Mono-Lock design allows you to lock and unlock the three sections of each leg using only one locking lever. The rotating lever provides a robust clamp mechanism that secures the legs and prevents them from slipping once locked. The single lever on each leg allows you to quickly lock the leg height without having to use two levers, making for a quicker workflow and sparing you from having to bend down to open a bottom leg lock to raise the legs. The legs feature spiked feet that provide solid purchase in soft surfaces when not using the included ground level spreader. The ground level spreader attaches to the spiked feet for working on delicate or hard surfaces. A retractable cord secures the legs for transport or storage. 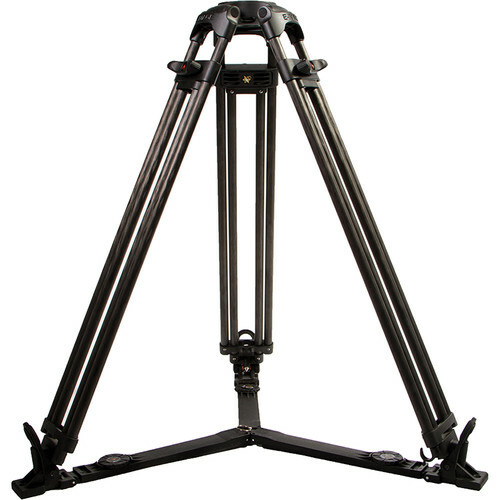 Box Dimensions (LxWxH) 36.0 x 9.0 x 9.0"
GC102 Carbon Fiber Tripod Legs is rated 4.0 out of 5 by 1. Rated 4 out of 5 by Aishou from Legs are Great! Spreader is Okay. The spreader is kind of cheap and is on the minimal level of reliability. That said, it's better than nothing, though you may want to swap it out. However, these carbon fiber legs are truly fantastic. They feel solid and long-lasting. The mono-lock design will save you lots of time, it feels firm and strong. The locks are easy to grab, lock and unlock with ease and speed. The locks have a rubber coating on them and it feels quite nice on your hands. I don't know if they will support 133 pounds without any drawbacks or increased wear. If you're willing to pay the toll and buy the rubber feet along with the mid-level spreader, you'll have yourself a solid, fast tripod that should last you a good while.